The hugely successful Seattle band Pearl Jam isn't what it was even six months ago. Fans are grumbling, integrity is being questioned, album sales are flat. So why are these guys smiling? BARCELONA, SPAIN -- The five members of Pearl Jam will look a lot more comfortable in 24 hours when they perform before 8,000 cheering fans at the Palau Dels Esports arena than they do now as they gather after dinner in the lounge of their hotel for an interview. On an off night in one of the most glamorous cities on any European tour itinerary, lead singer Eddie Vedder and his equally media-shy mates would rather be almost anywhere else. Yet Pearl Jam knows that it has some explaining to do. The question throughout the rock world: Are Pearl Jam's days as a multi-platinum act over? With album sales slumping and its credibility being questioned, Pearl Jam is the subject of widespread discussion. Quipped one industry veteran: "Pearl Jam always said they didn't want to be stars. Well, it looks they may soon have their wish." That possibility seemed unthinkable as recently as six months ago when the Seattle band was the toast of the record industry, having racked up $250 million in album sales in four years despite turning its back on videos, interviews, marathon tours and other promotional activities long considered essential to success in the pop world. Pearl Jam seemed to feel invincible when it declared war in 1994 on Ticketmaster, vowing to use alternative ticketing systems rather than support a company that it maintained charged fans excessive service fees--a move Ticketmaster called a publicity stunt. Then things appeared to start unraveling. The first hint of trouble was the grumbling last year of frustrated fans who complained they couldn't see Pearl Jam live. Many blamed the group's "obsession" with Ticketmaster for the group's low concert profile. To compound matters, the band's reputation was hurt when--unable to play in premier rock venues such as the Forum in Los Angeles because those facilities have exclusive contracts with Ticketmaster--the band sometimes scheduled its few dates in out-of-the-way places that proved to be logistical nightmares. The band was called everything from arrogant to naive. The shock, however, came in September when the group's fourth album, "No Code," sold only 367,000 copies in its first week. That was the seventh-highest opening week total of the year, but a whopping 61% drop from the group's 1993 high of 950,000 first-week sales for "Vs." And the sales of "No Code" didn't pick up. Last week, the album--which retailers had counted on being one of the hot holiday sellers--sold 25,000 copies, making it just No. 77 on the national charts. Total U.S.sales to date: about 1.1 million. Rolling Stone magazine went for the jugular in an October cover story that suggested that Vedder, who has spoken in interviews of a troubled childhood, was actually a popular student in high school, active in drama classes. The implication was his whole anti-rock-star persona was an act. To some, all these events suggest that Pearl Jam is at a crisis point--at least commercially. "I think they are still a very, very important band culturally, but they've got to rethink the way they promote themselves if they want to continue to be one of the big players," said one executive who has no business ties to the band or its label, Epic Records. "The way it is now, they are cutting themselves off from their fans. With some changes, however, they could be as big as ever. It's their choice." In the Barcelona hotel lounge, the band--Vedder, guitarists Stone Gossard and Mike McCready, bassist Jeff Ament and drummer Jack Irons--left little doubt about their position. They said they feel good about their brief U.S. and European tours and are looking forward to doing more dates in the U.S. next spring and summer. Though they still won't use Ticketmaster, they will work with regional ticket companies in some markets, thus allowing them to play more conventional rock venues. But no, Pearl Jam doesn't plan on the kind of marathon tours--or other extensive promotional activities--that industry executives believe are required to guarantee multi-platinum sales. "I guess what has happened to us with this record shows that promotion really does matter, just like everybody told us," Vedder says during the group interview. "If you don't operate in that framework, which we don't, it's obvious that you won't sell as many records. And that's fine. We expected this to happen much sooner than it has. "To us, it's about choices and lifestyles. Do you want to spend your time on the road and doing promotion, or do you spend your time making [new] music and living your life? At the end of the day, what is most important? To us, I'd like to think it's our music and the quality of our lives." For all the industry debate over Pearl Jam back in the States, the band members are surprisingly upbeat as they step onstage at the Palau Dels Esports. To the delight of cheering fans, Vedder speaks only in Spanish between songs--simple greetings such as "Hola! Como estas?" and "Nosotros estamos muy bien." When the band returns for the final encore, however, the musicians throw out the night's high-energy set list and close with a sweet, uplifting tune from "No Code." The song, "Around the Bend," means a lot to Vedder, and he doesn't know enough Spanish to introduce it that way, so he resorts to English. "This one's a lullaby," he says of the song, which he wrote for drummer Irons' infant son. "So, go home and sleep peacefully... have nice dreams." That same positive spirit was felt earlier in the night during "Alive," one of the 1991 Pearl Jam songs that helped establish the group in the '90s as the new voice of disaffected American youth. Instead of ending the song with "I'm still alive," as he does on record, Vedder, who often stands at the microphone with his eyes closed while he sings, pointedly looked out at the crowd as he changed the line to "We're still alive... we're still alive." Vedder was emphasizing the song's self-affirmation message, but it's tempting to think that he was singing about Pearl Jam itself. In a series of interviews that stretched nearly five hours, the group spoke candidly about the tensions that almost tore the band apart during the making of the "Vitalogy" album in 1994 and the showdown last year in San Francisco that finally brought it back together. "All the success happened so fast that it took awhile for us to get our balance, to get past all the bickering and the infighting, and we are still learning," said guitarist Gossard, sitting in the hotel lounge the night before the concert. "I think we've learned something about long-term relationships and pulling together, and I feel good about it... There was a time around 'Vitalogy' when I didn't know if Pearl Jam had a future. It feels like a band now. We realize what a great opportunity we have to make music together, and we don't want to throw that away." Many of rock's greatest bands were remarkably short-lived. For every Rolling Stones that goes on forever, scores of bands never celebrate their 10th anniversary -- from the Beatles and the Doors to the Clash and the Police. Despite the current bonding, everyone in Pearl Jam knows just how delicate the rock 'n' roll journey can be. As Gossard notes, there were times when they didn't know if they would be able to raise a toast to five years together. 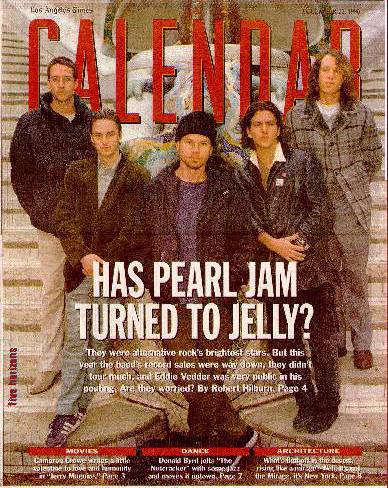 Pearl Jam, which was started by Gossard and Ament, released its debut album, Ten, in 1991, and it sold 10 million copies before the band members -- who then included Dave Abbruzzese on drums -- had much of a chance to get to know each other. Vedder has spoken in interviews about feeling uncomfortable with all the attention, but others in the band also had trouble dealing with the expectations and demands of being part of the biggest--and, by some accounts, the most influential--American rock band of the '90s. "When we first started, I think we went through a year's worth of touring, and it drove everybody crazy," said McCready, recalling his own insecurities that led to a heavy dependence on drugs and alcohol. "You're sitting around, asking yourself if you deserve to be in the band, whether the success wasn't just some kind of fluke. As we got bigger and bigger, it was a great excuse for me to party more--to forget the worries. It got so bad that I thought they were going to kick me out." McCready finally checked into a rehab center in Minnesota and has been clean now for almost two years, he says. For most of the band, the problem wasn't drugs but simple communication. One of the biggest misconceptions about Pearl Jam, observers say, is that Vedder is the only member with opinions. Gossard and Ament, however, also play key roles in shaping the group's decisions. In fact, it was Gossard and Ament who initially wanted to bypass Ticketmaster. Communication among the three was hindered by Vedder's early tendency to go into a shell and disappear, several people close to the band said. "It's not that he's trying to cause trouble, but it's how he handles pressure, and that left the others wondering what was going on," one observer said. As the band got more successful, the communication gap widened. By the time of "Vitalogy" in 1994, Gossard, whose guitar riffs have been the catalyst for many of the group's most popular tunes, thought of quitting. The situation began to improve when Irons replaced Abbruzzese, who was fired at the end of the "Vitalogy" sessions. Irons was perceived as everyone's friend -- someone whom Gossard and Ament had wanted from the beginning to be the group's drummer and who had long been close to Vedder. "Jack brought an openness to the band, actually initiating communication," Ament says. "We were all guilty of going off in our own little isolated worlds, but Jack has a way of bringing you together." But the real turning point, most band members agree, was the Pearl Jam concert with Neil Young at Golden Gate Park in San Francisco in the summer of 1995. Pearl Jam withdrew from the road in the spring of 1994 after the suicide of Nirvana's Kurt Cobain, an act caused in part by Cobain's inability to adjust to stardom. At the time, Vedder said he feared he might end up the same way. It was more than a year before the band toured again, and they only did a week of shows before Vedder was forced to leave the stage at Golden Gate Park, complaining of food poisoning. To the rest of the band members, it was pressure that got to Vedder -- and they stopped the tour on their own, sending the crew home. "That was the day we acted as a band," Gossard said. "In the past, we had kind of allowed Eddie to steer the ship in some ways, and it's still that way. You want him to feel good about the situation, because when he's feeling good about it, it makes the whole thing work. But that day you could see he was totally sick but still trying to push himself. When we saw what was happening, the band finally said, 'This is insane. We've got to stop.' We couldn't let him feel like he's got to tour because we're expecting it from him. "We all got together after that and talked things over... Why are we in a band? Do we really like each other? Do we really want to play music together? It was a new beginning." So how stable is Pearl Jam? Kelly Curtis, the group's manager, says he has never seen the musicians closer than on the European dates, where they were delighted with the shows and were free to move about during the day without the media and fan spotlight that follows them in America. Someone outside the management company who has worked with the band from its early days believes that the current sales drop may actually be a blessing. "What has happened with this record has taken some of the pressure off the band," the observer said. "The whole reluctance to do press and video wasn't some anti-establishment statement. One of the concerns was they didn't want to do anything that would explode their fame even further. Some of that pressure is off now and that makes it liberating. I wouldn't be surprised to see them do a few more things, even a video at some point." That could be good news for Epic Records stockholders. One respected rock manager who has worked with numerous high-profile 90s bands says a video may be all that is needed to restore Pearl Jam to the Top 10. "It's important to remember that it was the 'Jeremy' video for the first album that first turned kids on to the band," the observer said. "That carried them, image-wise, for three years. It gave Eddie this great mystique. The trouble is kids who are just starting to buy records today don't know that video. Unless they got a Pearl Jam record from an older brother or something, they don't know who the band is. Pearl Jam needs to reintroduce themselves." On the question of touring, Curtis says he expects the group to do 30 to 40 shows in the U.S. next year. Why not 75 to 100 shows, which would be normal for a band of its size? "I think touring is always going to be a compromise," says bassist Ament. "Eddie and Jack are both married and they don't like to tour a lot, while some of us would probably like to tour more. I can go either way. "One thing that people should understand is that it's not Ticketmaster that is keeping us off the road. We are playing as much as we want to right now. I think we learned things from the 12 shows we just did in the States that will make it easier next time. I know we made some mistakes in touring, but we were just trying to do what we thought was fair to the fans. "The Ticketmaster issue has gotten the most attention, but it was just one piece of the puzzle. We also tried to work with arenas to keep the price of T-shirts down, and we tried to put up special barricades at shows that would make it safer for the fans. It was how we felt a band should be." Angered by the Rolling Stone article, musicians and others who have worked with the band -- from Young to director Tim Robbins -- have stepped forward to defend Vedder and the group. Michael Stipe and Courtney Love reportedly have written letters to the magazine. Susan Silver, who manages rival Seattle bands Soundgarden and Alice in Chains, is part of the chorus of support. "Pearl Jam has gone through the kind of success that only one or two bands a decade experience, and I think they have remained genuine as people and as musicians," she said. "I have nothing but respect for everyone in the band." Vedder swears he hasn't read the controversial Rolling Stone article, though he acknowledges that people have told him about the story's contents. "I know who I am, and I don't need to read someone else's bitter take on it," he says, backstage at the arena with Irons. Asked about the magazine's claim that he was really a popular kid on campus, he shook his head. "If I was all that popular, I am just finding out about it now," he said. "I must have had a bunch of friends I didn't even know about. . . .I don't think that was the case. It must just be so many people now saying they were my friends." Despite the generally upbeat mood in the band, he says his personal battle is not over. He is proud of the new album, and he has enjoyed the U.S. and European tours. Yet he still carries the emotional scars of that first explosion of stardom--which has led to a total disruption of his personal life, including stalkers at his house in Seattle. "Good days, bad days," he says, flashing a smile. "Sometimes I think of how far I've come from the teenager sitting on the bed in San Diego writing 'Better Man' and wondering if anyone would ever even hear it. But then there are times when it just all seems too much." Vedder and the rest of the band feel more comfortable talking about the music, which has taken a deeper and more personal tone since Vedder wrote the spiritually tinged song "The Long Road" last year after the death of Clayton Liggett, the drama teacher who was his favorite instructor at San Dieguito Union High School in Encinitas. Overlooked in all of the questioning of Pearl Jam's sales punch is that the group's music has matured dramatically, the unrelenting teen angst of the first two albums now augmented with a more universal and, in the best sense of the term, classic rock vision. In its year-end review of albums, Rolling Stone even suggests that rock fans should focus on the group's music and not worry about other issues surrounding the band. About the music, the magazine declares thumbs up--from the "sober acoustic contemplation" to the "compelling emotional interrogation." Of the searching, introspective tone of such songs as "Off He Goes" and "Present Tense," Vedder says, "I think there's a little self-examination in those songs, something that a lot of my friends are going through too, as they approach 30." Listening to Vedder, Ament nods. "Except for a few moments on the first record, a lot of times Eddie's lyrics were just stories to me," the bassist says. "I knew he was a great writer and there was a lot passion behind the lyrics, but I didn't always relate to them. On this record, it's like my own thoughts are in the songs... In some ways, it's like the band's story. It's about growing up."